Since Nightwish recently raised the bar to atmospheric levels, having added progressive nuances to their repertoire, any female-fronted symphonic power metal band has a huge challenge before them. Germany's Xandria is one such band which, likely, can't compete in that particular category. However, if you long for the glory days of the Tarja Turumen-era Nightwish, Xandria more than adequately fills the void with Neverworld's End. It's been five year's since the last Xandria album Salome, The Seventh Veil. In that same period of time, they've gone through three vocalists, settling with Manuela Kraller (ex-Haggard). She has that familiar range, having both the operatic and gothic feel, though she's not as piercing as Tarja (a good thing). After this, much of Neverworld's End is self-explanatory: expect lavish and bombastic symphonic power metal. Period. There are several epic pieces, A Prophecy of Worlds to Fall, The Nomad's Crown, and Soulcrusher, all of which are rather impressive. There's also the catchy accessibility of Blood On My Hands. It's not exactly Wish I Had an Angel, but it's quite good. Also, what would symph-metal be without a melancholy tune? The Dream Is Still Alive Fills the bill. There's some folk or Celtic notes on Call of the Wind and Cursed. Many times the songs near more traditional power metal, with the synth-symphonic side an undercurrent as on The Lost Elysion. One might say, after a spin or two, that Neverworld's End is more traditional metal than the gothic/symphonic thing. But, conversely, the genre pendulum swings both ways on this album. Finally, and noteworthy, are Kraller's impressive vocal performance (let's hope she sticks around for the next album) and the classic metal fret work from founder Marco Heubaum and Philip Restemeier (though I'm not sure which one actually handles most lead duties). 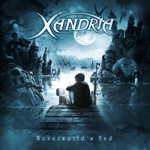 Overall, for pure female vocal centered symphonic power metal, Xandria's Neverworld's End is fine material. Miss the Nightwish of old? Then welcome back Xandria, after a five year absence, and their latest Neverworld's End. Fundamental, solid, and entertaining female-fronted symphonic power metal. A guilty indulgence.